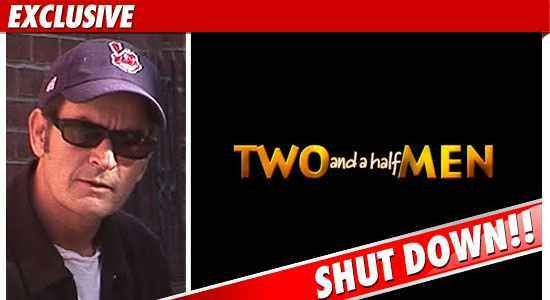 TMZ has learned "Two and a Half Men" will immediately stop production for the rest of the season ... because of Charlie's escapades in the last few days ... most recently what he said to TMZ. CBS and Warner Bros. say, "Based on the totality of Charlie Sheen's statements, conduct and condition, CBS and Warner Bros. Television have decided to discontinue production of 'Two and a Half Men' for the remainder of the season." The decision comes several hours after TMZ posted a story in which Charlie Sheen challenged creator Chuck Lorre to a fight, calling him "a stupid, stupid little man and a pu**y punk that I never want to be like." Sources connected with the production tell us ... Charlie's comments to TMZ were the final straw. No word on whether production will resume next season.